If you have arrived here from Maz Woods’ aMAZing Creations then you are in the right place. If you landed here by accident, no problem, please join in by following the link at the end of this post. Today I would like to share with you a layout which features CTMH’s Dreamin’ Big paper suite. As you may have guessed by my schedule this year, I love to travel – whether it’s exploring our beautiful GodZone NZ, or further afield. So the Dreamin’ Big paper suite would have to be my favourite from our current Seasonal Expressions Book, as it so suits outdoorsy photos, whether that’s from your backyard, or further afield. And here it is again with photos. (In fact, it’s not quite finished, as I’m popping flip flaps over the photos on the left so I can add in some more photos. You didn’t really think I only took 4 photos on this day did you??!!). Did you note I’ve switched the pages around?? It’s a very versatile layout. But just for arguments sake, which way is your favourite? 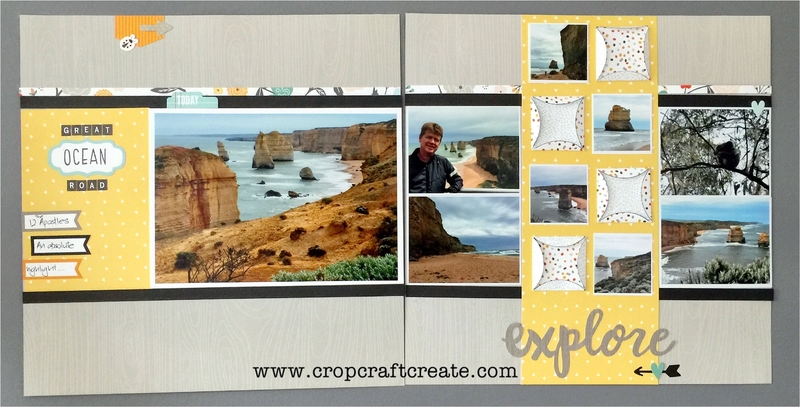 Now, as a little bonus, because pages always look better with photos, and because this is an Australasian blog hop, here’s another page that highlights our amazing trip last year along the Great Ocean Road. So can you see why I LOVE this paper so much?! This paper suite is only available until the end of April, so don’t delay, contact your consultant today to order it. If you don’t have a consultant, or if that’s me (! ), you can order it via email at megan@cropcraftcreate.com, or directly from my website by clicking HERE. What gorgeous layouts you have created Megan! I love them all but my vote is version 1 for the first layout. I love the way the 2 triangles form a square in the centre of the design. Your layouts are great but I don’t think I can choose one version over the other. I really like how these papers go with just about any photos. Your pages look great. I like both variations, really love the first one, like Shaunna said, it creates a great square.